Hubert Neal McGaughey, Jr. (born July 30, 1958 in Jacksonville, Texas) is an American country music singer of mixed Irish and Filipino descent. 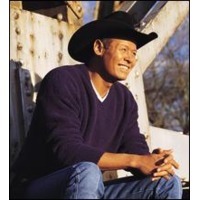 Known professionally as Neal McCoy, he has released ten studio albums on various labels, and has released 34 singles to country radio. Although he first charted on Billboard Hot Country Songs in 1988, he did not reach Top 40 for the first time until 1992's "Where Forever Begins", which peaked at #40. McCoy broke through a year later with the back-to-back Number One hits "No Doubt About It" and "Wink" from his platinum-certified album No Doubt About It. Although he hasn't topped the country charts since, his commercial success continued into the late 1990s with two more platinum albums and a gold album, as well as six more Top Ten hits. A seventh Top Ten hit, the #10 "Billy's Got His Beer Goggles On", came in 2005 from his self-released That's Life, also his most recent studio album.